66 • RV PRO • March 2019 rv-pro.com O R I G I N A L E Q U I P M E N T Atwood Mobile Products, which Dometic acquired in 2016. And, the Atwood acquisition also brought the company the assets of Fan-Tastic Vent, which Atwood pur- chased in 2010. "While we're one Dometic, we have our roots in a lot of different companies that we've brought together," says Miller. "We like to think of having a great brain trust that has been brought together to serve our core competence, which is mobile living applications." 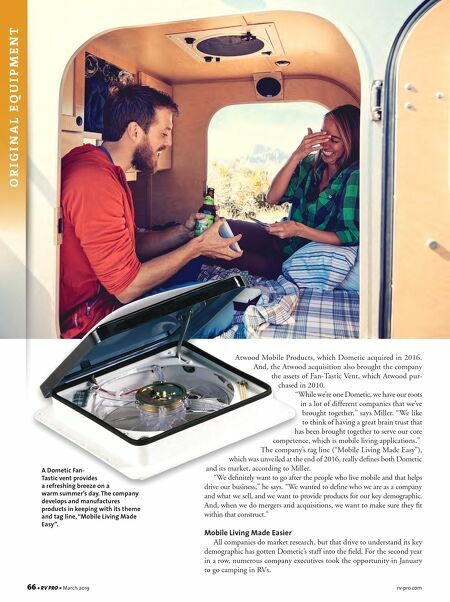 The company's tag line ("Mobile Living Made Easy"), which was unveiled at the end of 2016, really defines both Dometic and its market, according to Miller. "We definitely want to go after the people who live mobile and that helps drive our business," he says. "We wanted to define who we are as a company and what we sell, and we want to provide products for our key demographic. And, when we do mergers and acquisitions, we want to make sure they fit within that construct." Mobile Living Made Easier All companies do market research, but that drive to understand its key demographic has gotten Dometic's staff into the field. For the second year in a row, numerous company executives took the opportunity in January to go camping in RVs. A Dometic Fan- Tastic vent provides a refreshing breeze on a warm summer's day. The company develops and manufactures products in keeping with its theme and tag line, "Mobile Living Made Easy".